A look ahead to what major new innovative drugs are expected to gain approval in 2016 and beyond. Andrew McConaghie reports. 2015 was an outstanding year for the pharmaceutical industry, with 45 new chemical or biologic new entities being approved by the US FDA. This made it the second most productive year ever after 1996, when 53 were approved. The tally of 45 last year built on the 41 approved in 2014, so can the pharma and biotech sectors maintain this momentum in 2016 and go even further? Making a straightforward comparison between the years up to July, the answer could be ‘no’. By the end of July last year, 20 innovative drugs had been approved, including Novartis’ Entresto, Pfizer’s Ibrance and Vertex’s Orkambi. Compare that to this year, and the tally up to the end of July is 16, significantly off last year’s pace. There has, however, been no shortage of truly innovative drugs coming through. Some of the most notable approvals so far include AbbVie/Genentech’s chronic lymphocytic leukaemia (CLL) treatment Venclexta, Intercept’s liver disease treatment Ocaliva and Merck’s hepatitis C challenger Zapatier. 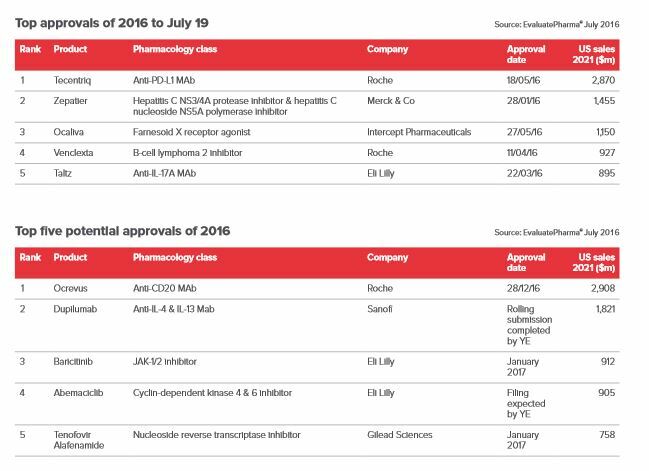 The biggest 2016 approval so far, in terms of forecast peak sales, is Roche’s Tecentriq (atezolizumab). The immuno-oncology drug was approved for treatment of locally advanced or metastatic urothelial carcinoma (mUC) and Evaluate Pharma predicts it could hit revenues of $2.87 billion by 2021. One of the biggest contributors to this revenue could be in non-small cell lung cancer (NSCLC), with the FDA likely to grant approval in this indication in October. This will create yet more competition in lung cancer, especially after Bristol-Myers Squibb’s recent Opdivo setback left the market open wide. So is there any chance of a surge in approvals in the last few months of 2016? In its mid-year review, Evaluate Pharma says another 30 drugs could still gain FDA approval this year, which would bring the final total to 47, pushing it past last year’s performance. However the analysts also forecast that the drugs approved in 2016 are not likely to generate the same levels of revenue as those approved in 2015 and 2014. 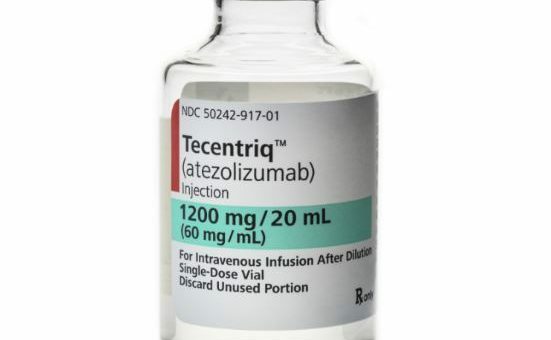 The only drug tipped to eclipse Tecentriq in terms of potential revenues is Ocrevus (ocrelizumab), Roche’s multiple sclerosis (MS) drug. The company is seeking a licence in relapsing MS and primary progressing MS and, if approved, it will be the first ever for both variants of the condition. The drug was the first MS treatment to be given an FDA breakthrough therapy designation, and then in June the FDA accepted its filing and granted it a priority review. The Ocrevus submission is based on strong data from three phase 3 studies which met primary and key secondary endpoints. Data from two identical studies (OPERA I and OPERA II) in people with relapsing MS showed the drugs was superior to Rebif (interferon beta-1a). The drug reduced relapse rates and disability progression sustained for at least three and for at least six months, compared with Rebif. This has led analysts to believe that the drug could take market share from many other existing MS treatments and grow the primary progressive MS market, thereby earning the company a forecast $2.90 billion by 2021. The next biggest potential earner is Regeneron and Sanofi’s dupilumab. The drug has already produced some spectacular results in treating atopic dermatitis with trials showing it can clear, or produce near complete clearing of, skin lesions. Evaluate forecasts revenues of $1.82 billion in 2021. The field of hepatitis B treatment is also one to watch, with key decisions expected in November and December. The potential market for new products is enormous – more than 360 million have chronic hep B infections, and around 620, 000 people die every year as a result. A vaccine against hep B has been available since 1982. The FDA is expected to give its judgement on Gilead’s Tenofovir Alafenamide (TAF) for treatment of hep B on 12 November. Gilead is looking for its next blockbuster to revive its flagging performance now that the hep C market appears to have peaked. In fact hep B affects even more people than hep C, but a mix of factors, most notably that most hep B cases are in the developing world rather than established pharma markets, means Evaluate predicts TAF will only achieve around $758 million by 2021 in this indication. Then in December, Dynavax’s Heplisav-B vaccine against the infection has its own red letter day. Dynavax’s product promises a simpler administration than the existing vaccine, allowing patients to be treated with two injections over one month compared to three injections over six months. There is no doubt that the sector’s pipelines are brimful of hugely exciting drugs, but if there are setbacks, delays or late stage failures, these will hit earnings. New waves of innovation, including gene therapy and CAR-T drugs are also close at hand, but the earliest of these aren’t expected for filing until 2017. Meanwhile, Lilly’s pivotal data readout on its Alzheimer’s candidate solanezumab is expected this autumn. Even if the EXPEDITION-3 trial shows only modest (but clear) benefits for patients in delaying Alzheimer’s progress, Lilly is likely to have a blockbuster drug on its hands. 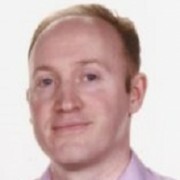 However the high failure rate in Alzheimer’s – including earlier trials of solanezumab – means most analysts are pessimistic about its chances of success. November will, of course, also see the US presidential elections, which are always a potential pivotal moment for the sector. Hillary Clinton is currently favourite to be the next President of the US, and one of her most memorable campaign pledges is a promise to crack down on pharma prices. While this threat can be overstated, a general shift in the US pricing environment is already under way. This makes it very difficult for pharma to keep raising prices on new specialist drugs and, therefore, will require the industry to keep adapting how it develops drugs and calculates R&D investments and productivity.